Pierre- Emerick Aubameyang has spoken out about his biggest frustration at Arsenal since joining the club from Dortmund in the January transfer window. The Gunners splashed out £56million to sign the Gabonese international, and he’s netted three in his first six fixtures for the north London club. But every game he has played for Arsenal so far this season – bar the Gunners’ Carabao Cup final defeat to Manchester City – has been in the Premier League. And it seems his inability, due to his ineligibility, to represent Arsenal in the Europa League is causing nothing but frustration for the forward. “I am really frustrated because the rules are a bit… I don’t know how to say in English, but I am disappointed because I can’t help my team,” he told talkSPORT. Aubameyang, found the back of the net in Arsenal’s 3-0 win over Watford last time out, linking up with his former Dortmund team-mate Henrikh Mkhitaryan. The Gabonese striker later repaid the favour, putting the ball on a plate for the Armenian to net the Gunners’ third of the afternoon. Ahead of the game Sky Sports pundit Jamie Redknapp said he has been disappointed with what Aubameyang has served up for Arsenal so far this season. “I think if he costs £60million you want him in the team, he scored last week, but he hasn’t hit the heights yet. I have got to be honest, I’ve been a little bit disappointed,” said Redknapp”I thought he would come into the Premier League – I think he’s almost caught the bug of what has happened to the rest of the players, a lack of confidence, not really playing with any zip that we expect him to come into this league. “I think probably we will see the best of him next season. You are talking about a tremendous talent, but I do want to see a lot more, if I’m honest. 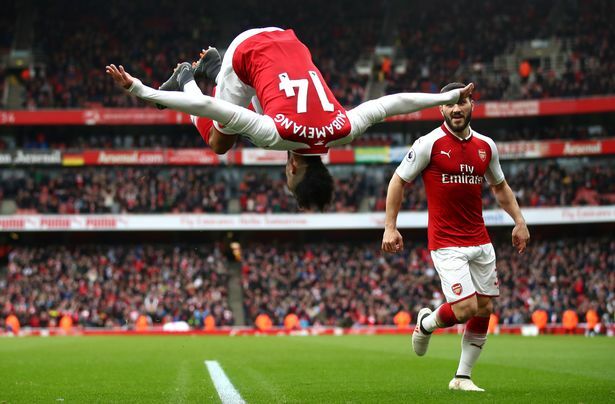 Aubameyang responded in the best possible way, with a goal in a convincing Arsenal win.